Britain's High Streets are in crisis. 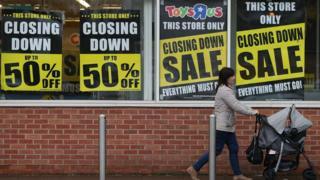 This week toy store chain Toys r Us collapsed into administration, along with the electronics retailer Maplin. The restaurant chains Jamie's Italian and Prezzo have announced closures, while fashion chain New Look and department store group House of Fraser are seeking to shore up their finances. Experts say retailers are battling a "perfect storm" of pressures and they expect more closures in 2018. A big factor has been a fall in discretionary spending, spurred by rising shop prices and weak wage growth. A near 15% fall in the pound since the Brexit vote has pushed inflation over 3% - way above the Bank of England's 2% target. This has made imported goods more expensive, with those costs passed on to consumers. Couple that with the fact that wages have been rising at a slower pace than inflation - and shoppers have less disposable income to spend in stores and restaurants. By volume, retail sales have continued to grow but at a much slower rate - falling from from 4.7% in 2016 to 1.9% last year. "It has been a real issue for high street retailers and accelerated the decline of some," says Samuel Tombs, chief UK economist at Pantheon Macroeconomics. "The sector was already suffering from structural problems, such as the rise in online shopping and high business rates. But the burst in inflation since the EU referendum has squeezed incomes in real terms, leading to much weaker growth in sales than retailers had anticipated." Online giants such as Amazon have had a huge impact on the high street as more consumers see online shopping as cheaper and easier than going to the shops. And while overall retail sales growth is weak, online sales continue to shoot up. Paul Martin, head of UK retail at KPMG, says: "With the overall market not growing, it is all about market share, and 20% of that market is held by online players. If you don't have the right online offering, again, you will struggle." That is pushing retailers to try to reinvent their stores, with the likes of John Lewis and Debenhams now holding more in-store events and "experiences" to lure shoppers in. If shops fail to do either "value, convenience, or experience" well, they will struggle, Mr Martin says. Toys R Us fell short in all three areas, according to Simon Thomas of Moorfields Advisory, the toy chain's administrators. He says it was "unlikely" the retailer can be saved because its business model "isn't what consumers really want now". "We've got very large stores which are fairly impersonal. People are looking now to have a better shopping experience, and we were unable to deliver that." Mr Thomas adds: "On top of all that we have the online problem … people can go into our shop, look at something, then look at an alternative and buy it at a cheaper price." Inflation is not the only cost pressure retailers face. The National Minimum Wage and new National Living Wage for over-25s go up each year, pushing up payroll costs. Trade body the British Retail Consortium estimates that the National Living Wage costs the industry between £1.5bn and £3bn a year. Business rates - which are due to rise again in April - are a burden too, it says. Retailers will pay an additional £2bn over the next three years compared to the last three years, a spokesperson says. "Business rates are deterring investment in local communities, causing shop closures and job losses in hard-pressed communities and preventing retailers from delivering what their customers want in an efficient and cost-effective way." With trading conditions tight, retailers cannot afford to have underperforming outlets. And yet many companies over-expanded during the good years, leaving them dangerously exposed. According to reports this week, New Look is set to close as many as 60 of its 600 UK stores as it continues to battle massive debts. Burger chain Byron said last month it would close as many as 20 outlets as part of a rescue plan approved by its lenders and landlords. At the time, boss Simon Cope said the firm wanted to focus on a smaller number of profitable restaurants. Richard Perks, director of retail research at Mintel, says: "In business you either go forward or backwards - but how do you go forwards? The natural thing is to open stores. People convince themselves they need to and then it goes pear-shaped. "But there's a lot more to being a successful retailer than your store count - having too many stores wouldn't kill you if you got everything else right." As a consequence of overexpansion, many retailers are shouldering "high debt burdens", says KPMG's Mr Martin. Just before its collapse, Toys R Us UK faced a looming VAT debt payment deadline of £15m. It would have been unable to pay it without a cash injection from an outside investor. Mr Martin says 2018 will continue to be difficult for retailers, but it's not all doom and gloom. "There will be winners and there will be losers. But if you're not good at online, if you're not really rigid about your cost structure, there will be more challenges to face going forward and no doubt we will see further casualties."